2012 OCE Arizona Wide Format Ink Jet Printer | National Prepress, Inc.
Océ NV has extended its series of wide-format printers. 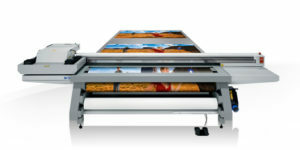 The launch of the high-speed Océ Arizona 550 XT flatbed printer at the FESPA trade show in Munich builds on the success of the Océ Arizona 550 GT system introduced in February 2010. By doubling the size of the flatbed, the Océ Arizona 550 XT offers customers the best value in the market for high-quality, large format rigid graphics production. High capacity print providers can now produce high quality display graphics on the largest rigid boards their customers need, at even lower costs.